Those who love to party, are short on vacation time, or are looking for a deal. 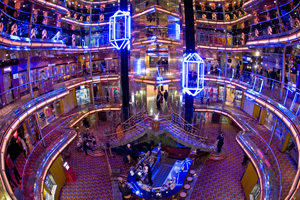 Anyone excited about Carnival’s newest innovations — this ship hasn’t been retrofit with, well, hardly any of them. The adults-only Serenity Lounge sun deck may be small, but it’s equipped with upgraded lounge chairs and two hot tubs, and it’s a peacefully quiet reprieve from both kids and the unrelenting DJ on the lido deck. Carnival Ecstasy is one of the first ships in the fleet to get the Carnival Live concert series, and to host performances from well-known acts such as Martina McBride and Foreigner. The atrium glows with neon. This is one of the oldest ships in the fleet, and it’s a testament to the line that, while the taste does feel dated — there is, for example, a lot of neon — it doesn’t feel worn or threadbare. In fact, it’s so well-maintained that I saw no signs of the rust, broken facilities, or musty smells that I’ve come to expect on 20-plus-year-old ships. For cruisers looking to let their hair down and enjoy the sun, the DJ by the pool, dancing in the disco and on deck at night, and short sailings, this older, simple ship is a modestly priced choice that delivers. 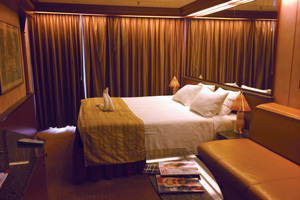 The ship's junior suites come with a couch. 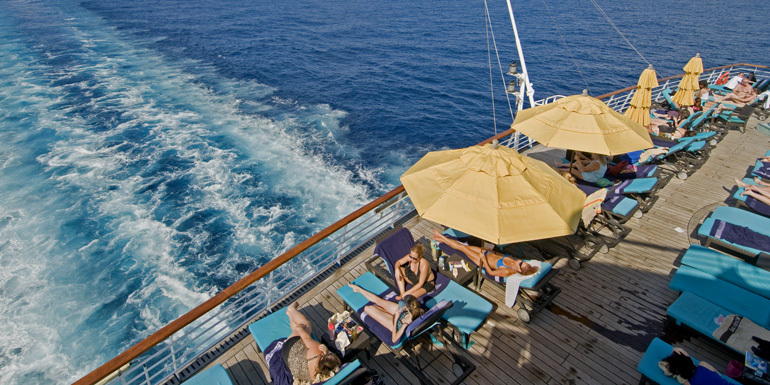 As an older ship, Carnival Ecstasy is much easier to book, due to a smaller number of cabin categories. There are no spa suites or concierge-level rooms here, and the presidential suites on this ship are used as incentives. You’ll find insides, outsides with a window, outsides with a veranda, family cabins (which come with drop-down bunk beds), junior suites (which have long vanities and a couch), and grand suites (which come with whirlpool tubs, Murano-inspired glass lamps, and lots of extra space). The look is modestly Italianate. This ship has — gasp! — no specialty restaurants at all, another reminder of just how far the industry has come in both the quality and diversity of its offerings (and its methods of extracting additional fees from passengers). A true signifier of how great Carnival’s recent no-fee upgrades have been is just how much you miss them when they’re gone. The burgers by the pool deck paled in comparison to the ones at the Guy Fieri spot on newer ships — those are made from freshly ground meat and served on recently baked buns; these are not. The Mongolian barbecue stand couldn’t hold a candle to the Blue Iguana taco bar that’s a signature of the Carnival 2.0 upgrades. Both had very long lines, though, because they were a small step up from the frozen pizza, simple sandwiches, and wan buffets in the interior part of the lido deck. If you’re a true food lover, you’re best served by booking one of the cruise line’s newer ships. But if you do end up on this one, make sure you hit the Taste Bar during cocktail hour each night. It serves complimentary samples of dishes prepared in the specialty restaurants on other ships, and it’s easily the most flavorful food onboard. Tip: On the night in Cozumel, the ship offers a late-night Mexican buffet that — for those who didn’t get dinner, or just spent too much time drinking in the hot sun — is a festive option. The food ranges from simple nachos and refried beans to beef quesadillas and tacos. The miniature golf course is surprisingly spacious. Touring a ship of this age and era takes relatively little time compared with newer, larger vessels with plenty of more sophisticated facilities. You’ll find a pool with two hot tubs, a more than adequate gym, a small spa, a couple shops, show lounges, bars, a casino — which always seemed to be crowded — and kids’ facilities. 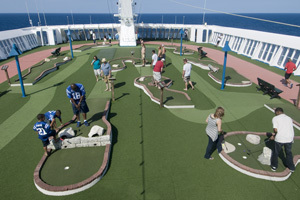 A couple highlights: A lovely, surprisingly large mini-golf course on the top deck is a really special space, with plenty of room and light, and it’s looped by a running track. The ship also has the Punchliner Comedy Club, a rare upgrade. There are three shows nightly: Two are for all ages, and one is adults-only. That said, the heart of the ship is easily the pool deck. There, a DJ spins party music all day long, and passengers crowd the pool with beer or frozen drinks in hand. It’s an upbeat, playful atmosphere throughout the day — meaning this is not usually a great place to read — and into the evening. On sea days, you’ll be entertained by raffles and competitions, including a hairy chest contest for men. Tip: The spa is small and lacking the relaxation areas of newer ships, but one upside is that the steam room and sauna — located in the locker rooms — are free of charge. The two hot tubs by the pool and the two in the Serenity Lounge are open 24 hours a day, and they’re lovely spots to enjoy a warm Caribbean night. What do you like best about Carnival’s older ships?